This is not a good photo of my art work, it is not sharp enough and the colour, compared to the original, it is slightly off, but I guess it will do. I am so not a technical person when it comes to any type of gadgets. I will have to wait until I get it properly scanned by my framer. 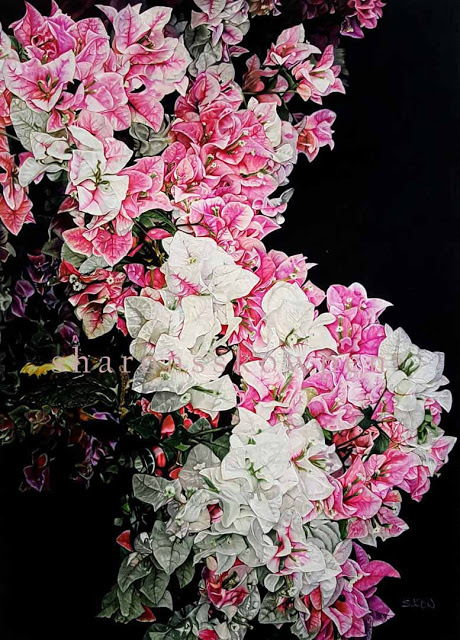 Bougainvilleas is a very common flowering plant in South East Asia. We have it along the highways and almost every street in town and residential areas in the whole country. It is something we Malaysian takes for granted.